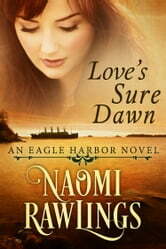 The bestselling Eagle Harbor Series continues with Book 3, Love’s Sure Dawn. Rebekah well remembers the pain she endured the last time she tried trusting Gilbert, and Gilbert can't afford to pursue the love of a working class woman. But they can't stop the forgotten feelings swirling between them—or ignore the sacrifices they'd both have to make for a future together. If you like inspirational stories of love, courage, and drama, then get your copy of the latest book in the memorable Eagle Harbor Series. What a great addition to Naomi Rawling's Eagle Harbor Series! Rawling's takes the life of George Sinclair and tells it beautifully! He's the typical rich kid who always got what he wanted except now that he's grown he doesn't just want to run to his father and ask for money to replace the ship and crane that he sunk in Eagle Harbor. He was raised to be selfish and demanding. Can he continue to be that that way as a grown man? A must read that includes the beautiful tom-girl Rebekah Cummings and all her not so conventional ways of getting things done in her life. I was provided a copy of this book by the author/publisher. All opinions in this review are my own.